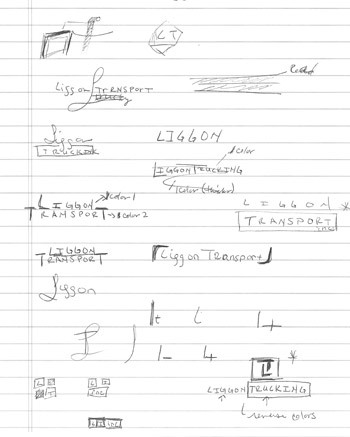 Logo Design Process, Liggon Transport Inc. Logo Design is one of the most important places to start with your business. Don’t forget a strong Logo will give your company the proper representation. That is why I have a standard logo design process I stick with that yields accurate and effective results. To most this may look like chicken scratch. However, this is step 2 in my logo design process, step 1 being a detailed meeting with my client to completely understand them and their industry. There are times when ideas come faster than the computer develops. So, I begin every project with pen, paper and notes. Logo design process, in black and white. If it works in black and white it will work in color, which will be added later. Using this method allows full focus to be on the structure and functionality of the logo. It is really easy to be distracted by color and lose focus on structure and usability. Remember, it’s best to develop a logo that can be used any where any time. Combining this sleek type style with the strength and energy associated with the color choices, makes this an effective Logo Design representing Liggon Transport Inc. The final step in the logo design process is application. 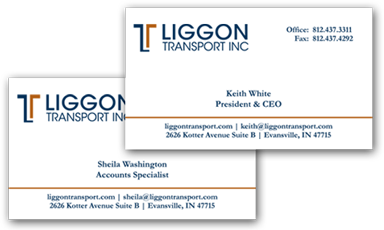 Combining this sleek type style with the strength and energy associated with the color choices, makes this an effective logo design representing Liggon Transport Inc.